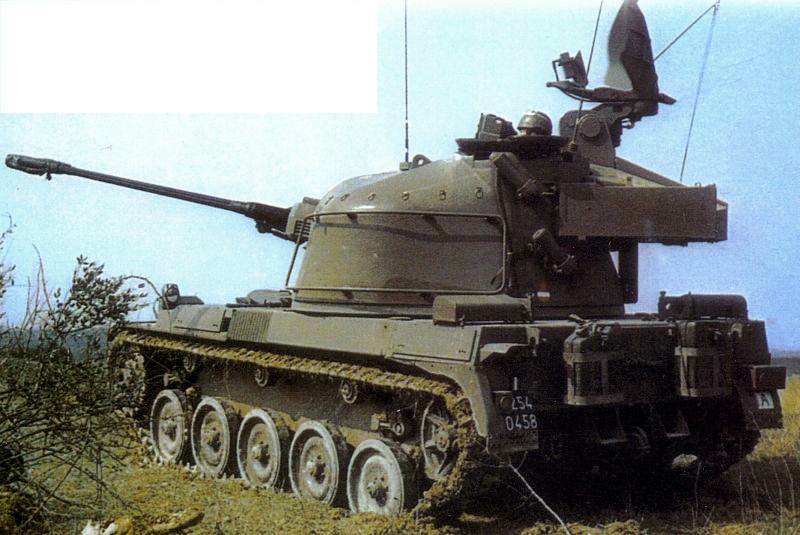 As for SPAAGs France only had a limited supply of WW2 M16 Multiple Gun Motor Carriage (MGMC) half track vehicles. 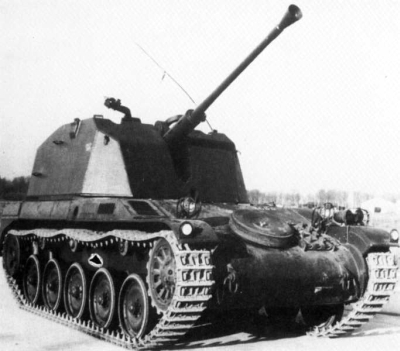 There were attempts in the 1950s already to use Panhard EBR and AMX-13 chassis for the task, mounting a 40 mm Bofors L/70 in various configurations. 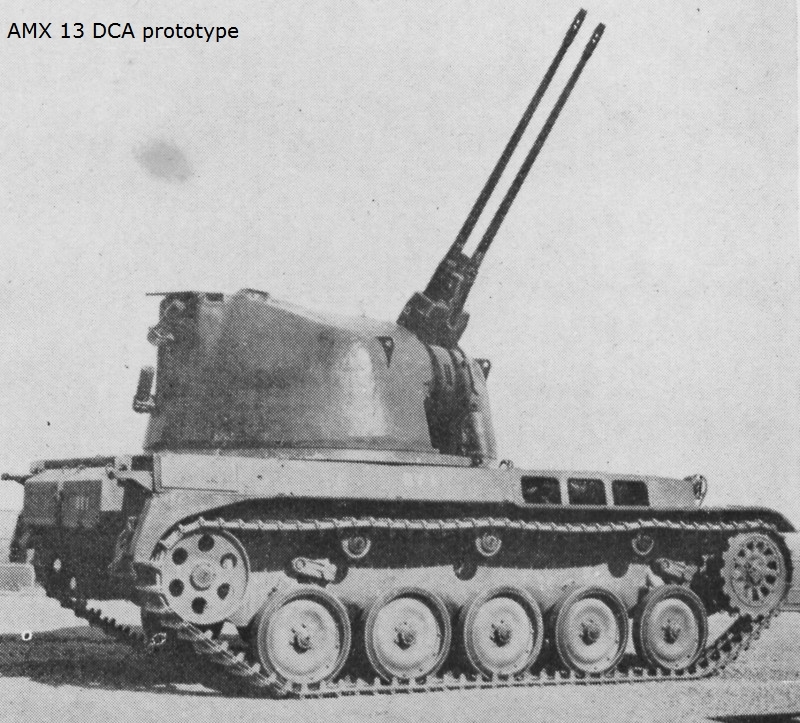 The only that made it out of studies into the real world was the “AMX-13 DCA canon de 40mm” in 1956, where DCA stands from “Défense Contre Avions”. It consisted in a rear-mounted armoured tourelle SAMM S-980, with a special mount allowing 90° elevation fire, while the turret provided a good overall protection with sloped sides and full 360° traverse. But this first attempt ceased in 1957 with all researchers on the SAMM S-980. 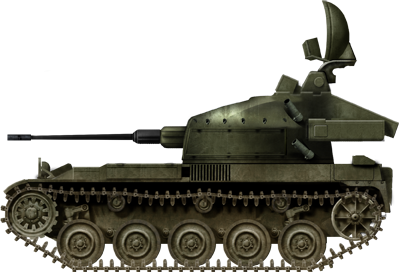 The Mle51 T1 gun had a 240 rpm, 993 m/s velocity. It has a COTAM radar, PHF 40 computer and L879 binoculars. A faster, twin-tube 30 mm solution was eventually preferred, as to not repeat the errors made by the American M42 Duster. 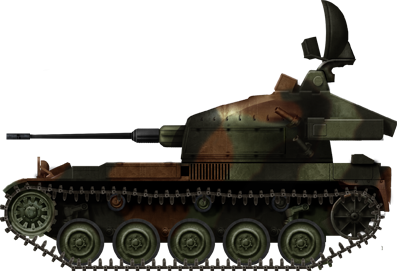 The AMX-13 DCA was, therefore, the second SPAAG (Self-Propelled Anti-Aircraft Gun) designed, but the first built in series in France. Development started in the early 1960s, around a new weapons system. The choice was made of the 30 mm Hispano Suiza HSS 831.A. SAMM (turret) Thomson-CSF (radar and fire control system) were also involved in the development. 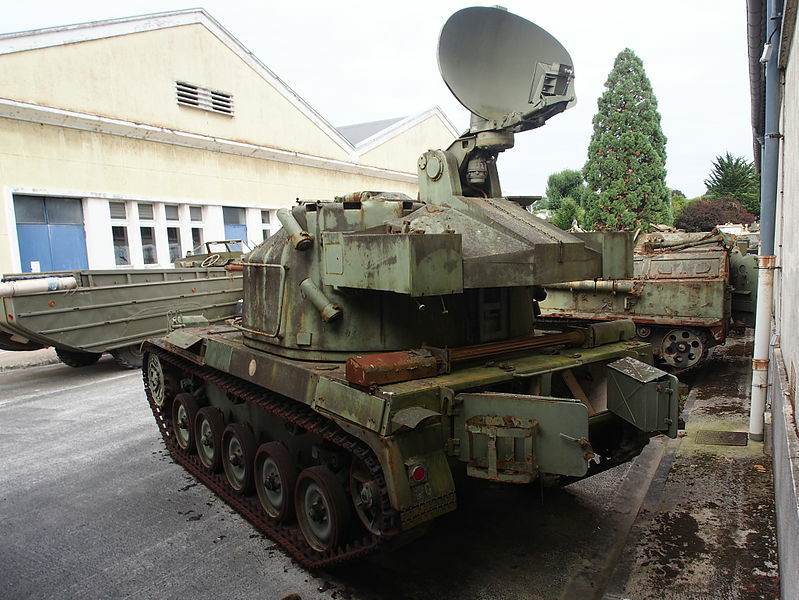 The twin 30mm AA self propelled was a highly maneuverable armored vehicle for the defense low altitude troops defence within 1000 m. The AMX-13 DCA assumed forward air defense to French tank battalions, was introduced in 1969, produced to a small number (60) but maintained in service until the end of the cold war. 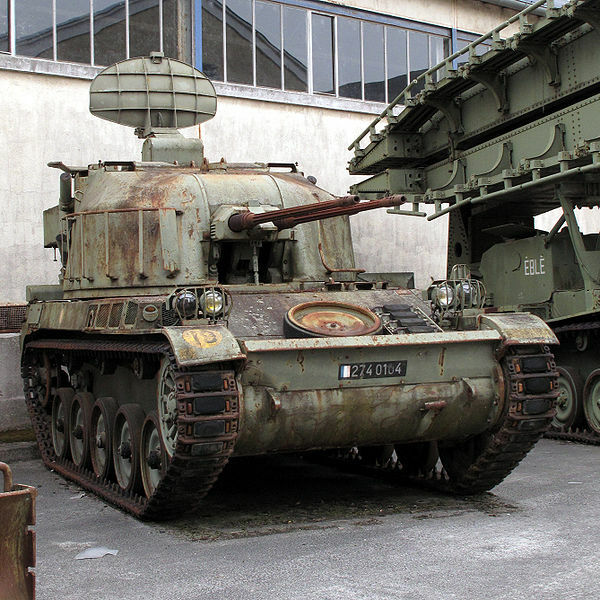 The chassis is identical to the AMX-13 model 1960s, but the turret is replaced by a larger, fully enclosed, two-man cast one designed by SAMM. The original configuration was kept, with the engine and drive train located at the front right, driver seated to the front left side. The armor is thin, about 20 mm at the front and 12-8 mm all around, protecting against small arms fire and shell splinter. In addition, a wave deflector and spare wheel were present on the glacis front. This model was not provided with NBC protection but instead four smoke grenade dischargers were fitted on the turret rear for concealment. Both commander and gunner were installed at the rear of the turret, one on each side with two-pieced hatches. The engine was the SOFAM 8Gxb 8-cylinder 250 hp petrol engine coupled with a manual, 5 forward, 1 reverse gearbox that provided a top speed of about 60 kph, enough to keep up with other AMX-13s. Power was passed onto six roadwheels per side, three return rollers, front drive sprockets and rear idlers. Tracks were 3.00 m long, 0.35 m in width. Ground pressure was 0.87 kg/cm2 and ground clearance 37 cm. The vehicle was not amphibious but can ford about 60 cm of water without preparation. Main armament was concentrated in the turret, with a twin tube, each being controlled by electric trigger and firing at the initial rate of 1000 m/s, either piecemeal or in bursts of 5 or 15 rounds. In free fire, it can reach 300 rpm. Pointing system was electro-hydraulically controlled allowing to track fast targets by rotating 80° per second, with a clearance height of 85°. Detection was assumed in a 12 km radius by the Oeil noir doppler radar, which could detect aircraft and helicopters up to 3000 m of altitude, also allowing to shoot accurately from a distance of 5000 m. There was a targeting panoramic sight for manual targeting as well. The gun mount had a -5 to +85° elevation for 45°/s powered, and 80°/s powered full traverse, but non-stabilized. The turret received a rear pannier for the spent rounds. Strapping bars were welded on the sides for fastening canvas and bagged storage. The AMX-13 DCA never saw combat, spending its active career in training exercises with armoured units. None was exported. 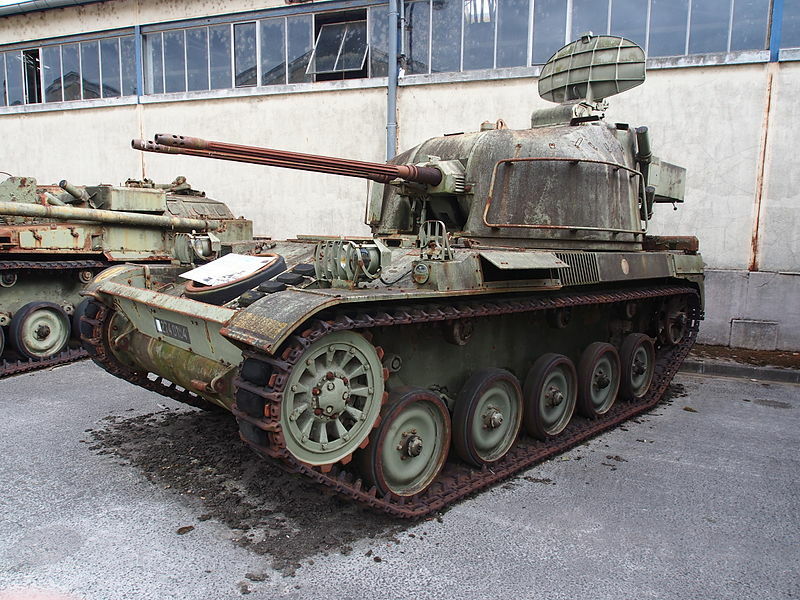 There was a parallel SPAAG project also based on the AMX-VCI, TA-20 turret as used in the VDAA system, with a twin 20 mm gun that was left at the prototype stage. Also based on the VCI, a quad-mount similar to the M16 GMC system was also tried (4x 12.7 mm M2HB). 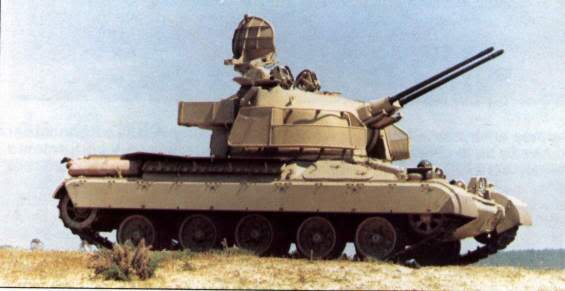 However, a relatively similar vehicle as the AMX-13 DCA was sold to Saudi Arabia, with a derivated turret but the much larger chassis of the AMX-30. The vehicles were painted with the standard French olive green, replaced in the 1980s with the standard NATO three-tone pattern. Early AMX-13 DCA with the standard olive green livery, 1970s. Late AMX-13 DCA with NATO livery, 1980s. No, this vehicle is the AMX-13 DCA.